Private Piaggio Avanti jets are available for daily rentals at the nearby Camarillo airport for $5000 per hour. The Avanti jet, the world's fastest turboprop, rivals the speed of most light cabin jets. The aircraft also boasts the same size cabin cross section as a super mid-size aircraft and has the benefit of the fuel efficiency of a turboprop. No other modern aircraft offers the functionality or versatility of the Piaggio. The plane has the ability to fly non-stop from New York to locations like Chicago, Atlanta, Florida or Miami. 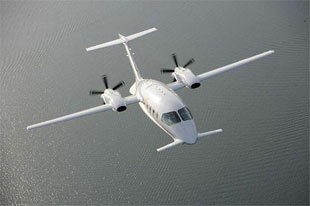 The Piaggio can fly at speeds of over 450 mph, yet it flys quieter and faster than most other aircraft in its class. The Piaggio features a spacious, elegant stand up cabin - with oversized leather seats, and superior amenities. The jet can hold up to 7 passengers plus a full crew. The maximum range of the Piaggio is 1,440 nm/4,656sm for 2 to 4 passengers, 1,300nm/1,495sm for 5 passengers, and 1,000nm/1,150sm for 6 passengers.